Priyo Netaji Bengali Poem Lyrics And Bengali Abritti Recitation by Bishakha Mukhopadhyay, Rusha, Shnaoli And Many Various Artists. এখনো অভিমান করে শুয়ে থাকবে রেনকোজিতে? বৌমা আমি বলিনি উনি ফিরে আসবেন ? This recitation of Bengali poem Priyo Netaji, respect towards the unforgettable hero and freedom fighter of India Netaji Subhash Chandra Bose. 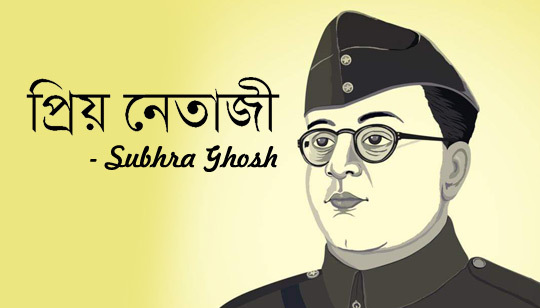 Poet Subhra Ghosh narrates how our the greatest and inspirational national leaders Netaji is missed in today's India.